Senior Natalie Maruschak, daughter of Jesse and Ginnette Maruschak, Senior John Davis, son of Matt and Michelle Davis, 8th grade student Andrew Mishriky, son of Farid Mishriky and Nermeen Noseir, 7th grade student Hunter Harris, son of Mark and Krista Harris, and 8th grade student Kaitlyn Miller, daughter of Dr. Ryan and Alison Miller. 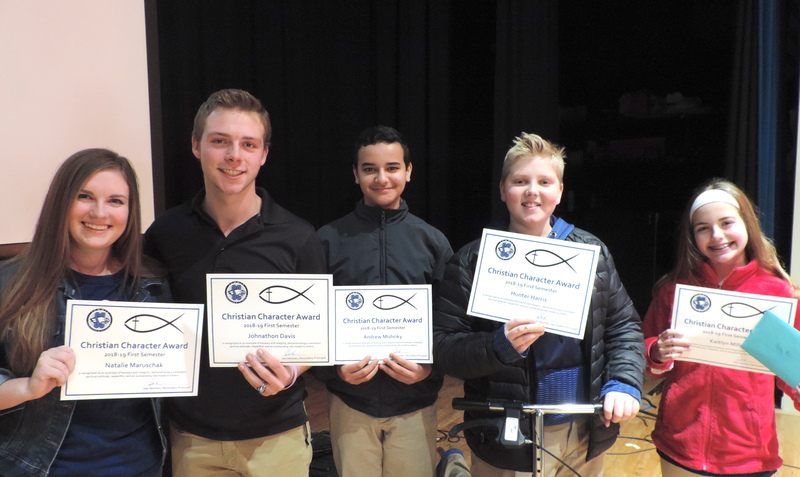 Summit Christian Academy (SCA) is pleased to recognize students who consistently exhibit exceptional Christian character through the Christian Character Award program. The purpose of this award is to encourage students to pursue their potential toward attaining the highest level of personal and academic development, as well as Christian character. The achievement of Christian Character at SCA is one of the most prestigious recognitions within the school.